Twilio is a cloud platform that allows developers to build, scale and operate real-time communications in their software applications. With Twilio’s cloud communications platform, businesses make communications more contextual by integrating voice, messaging and WebRTC directly into their applications. Twilio has more than 560,000 developers currently using their platform and companies like Uber, Airbnb, Coca-Cola and Home Depot trust Twilio to power their communications at global scale. 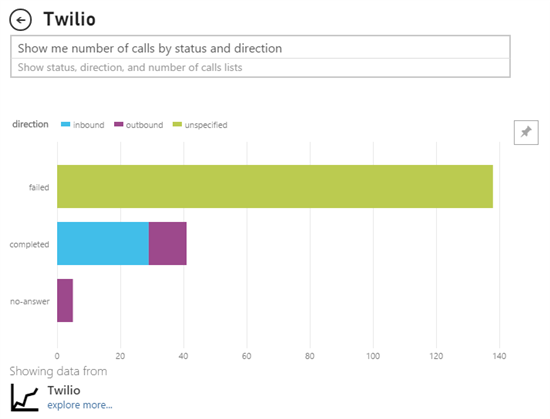 Today Microsoft and Twilio are very excited to release the Twilio content pack for Power BI. You can monitor all the details of your phone calls and text messages activities for the past 30 days as well as monitor stats like your all time spending, number and duration of calls and many more. Power BI and Twilio integration is quite simple; just click on the Twilio data source in the Get Data page and use your Twilio’s user name and password to connect. 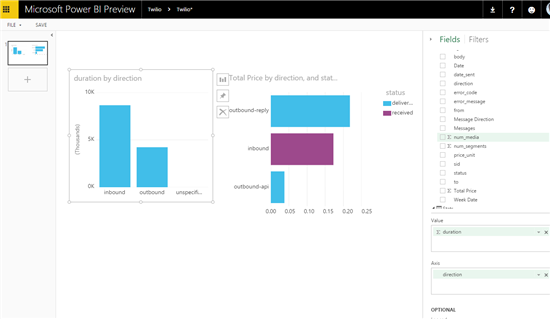 Once connected, Power BI will retrieve your data from Twilio and creates a data set as well as a ready-made dashboard and report that you can start exploring right away. 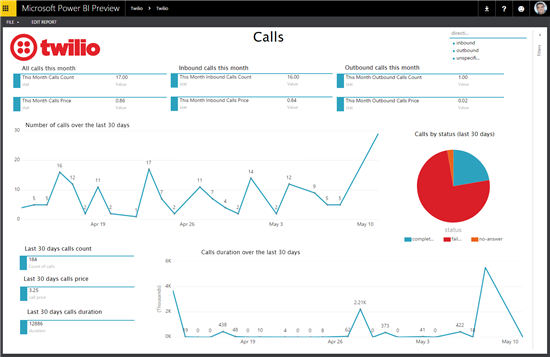 Power BI retrieves the calls and messages details for the last 30 days as well as some useful stats like your “All time spending” or “All time number of calls”, etc. Your data will be automatically refreshed everyday so your dashboard is always up to date. The dashboard shows you some quick insights from your data that we think you would like to monitor on daily basis, like the number of calls and messages in the last 30 days, calls and messages over time and many more. You can always edit the dashboard to make it show exactly what you’re looking for. While the dashboard is great for monitoring your data, you may want at times to explore the data a bit further. When you click on any of the visuals on the dashboard you immediately go to the underlying report where you can see some richer insights on your data and you can apply slicers and filters to find exactly what you are looking for. The out of box reports contains 3 different slides with different views on your data. 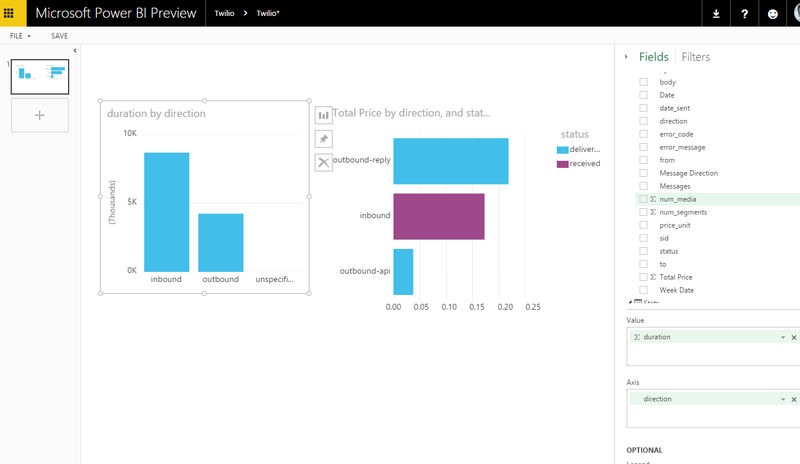 You can also use the Q&A capabilities in Power BI to explore your data by asking natural language questions. An example would be “Show me number of calls by status and direction” or “How many messages sent last month?” You can also pin visuals created by Q&A on your dashboard if you want to keep an eye on them. If the out of box report and dashboard are not enough, you can very easily create your own dashboards and reports exactly the way you want them. You can do that by clicking on the Twilio dataset under the Datasets sections. Once you do that, a blank report will open and you can drag the fields you want to visualize from the fields list to the canvas and start building your visualizations. 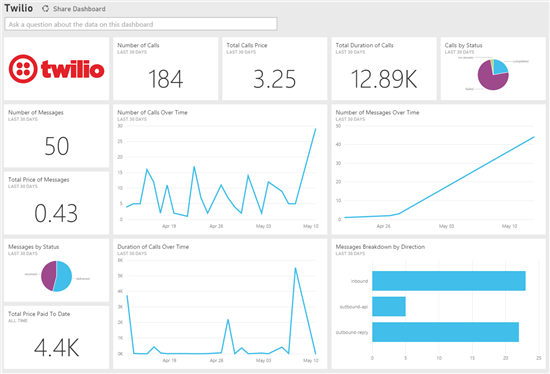 The time it takes Power BI to retrieve all your data and create the out of box dashboard and report will vary greatly depending on the amount of data you have for the past 30 days. If you have hundreds of thousands of transactions, it may take some time for Power BI to retrieve all of them. Super large accounts may encounter some issues while creating the content pack, we are working hard on eliminating those issues. In the meantime, please don’t hesitate to contact us through the support link at the top of the page if you encounter any problems.